Visiting a new church can be intimidating. When you visit the Liberty Church of Christ, you will never be asked to stand up, introduce yourself, or do any other activity that makes you feel uncomfortable. We’d just love to have you visit and study with us. We want you to feel comfortable when you visit us for worship services, so here is a brief summary of what you can expect from a typical service at the Liberty Church of Christ. When you visit one of our Sunday services, you can expect to find a simple worship service that adheres to the teachings of the New Testament. When we assemble on every Lord’s Day (Acts 20:7, Revelation 1:10), which is Sunday, we will worship God by . . .
Preaching: We will enjoy a Bible lesson that lasts about 30 minutes (Acts 2:42; Romans 10:14). On most Sundays, Bryant Perkins, our preaching minister, presents these lessons, though occasionally a guest speaker will guide our thoughts. Each lesson will take a Bible passage and explain what it means and how it applies to our lives. On Wednesday evenings, we meet in one of the many bible classes offered at 7 pm. The children are taught in age-appropriate classes by teachers who have prepared an exciting Bible lesson. The adults meet in the fellowship room, where currently we are studying the book of Acts. In all of our classes, you can expect to open the Bible so we can all study and grow in our faith. During these times we also encourage one another (Hebrews 10:24-25) and help one other maintain that Christian light (Matthew 5:16) to shine for others during our work week. After about 45 minutes of instruction, classes are dismissed for everyone to meet together in the fellowship room. We share announcements to the church, which include upcoming events and prayer requests for various needs. We then sing a song before a brief devotional of 2-3 minutes. Following the singing of another song or two, we join in prayer together and then dismiss for the evening. It’s a wonderful way to draw strength and encouragement in the middle of the week! You can expect us to have a wholesome respect for the inspired word of God, the sole and complete authority. Because the Liberty Church of Christ accepts the Word of God as the all-sufficient rule of faith and practice, we reject all human creeds (Galatians 1:8-9; Revelation 22:18-19). If you’re interested in becoming a Christian, we would love to have an opportunity to share what the Bible says to you about your relationship to God. The Bible teaches that we are saved by God’s grace, not through our own efforts or through our ability to do good works (Ephesians 2:8-9). We are saved completely by what Jesus did for us at the cross. In order to accept God’s offer of salvation, we believe in Jesus Christ as the Son of God (John 8:24). God convicts us of our sinfulness and leads us to commit our lives to him, which involves our repenting of and turning away from our past lives of sin (Luke 13:3). We confess our faith in Jesus (Romans 10:9-10) and accept the free gift of salvation as we are baptized into Christ for the forgiveness of our sins (Acts 2:38; Romans 6:3-5). As Christians, we try to live for Christ, though we fail him often. We draw encouragement from our relationship to local Christians in the church, and we worship God regularly. As we study the Bible, we grow in our knowledge and understanding, and God shapes us into the person he created us to be. If you have any questions about spiritual matters, or if we can help you in any way, please contact us. We would be thrilled to have an opportunity to get to know you better and to talk to you about God’s plans for your life. New Testament Christians first met in Liberty in 1932 at Liberty High School. Growth continued until our first building was built on the corner of Webster and Fannin streets in 1938. A second, larger building was built in 1959 at the corner of Cos and Fannin streets. 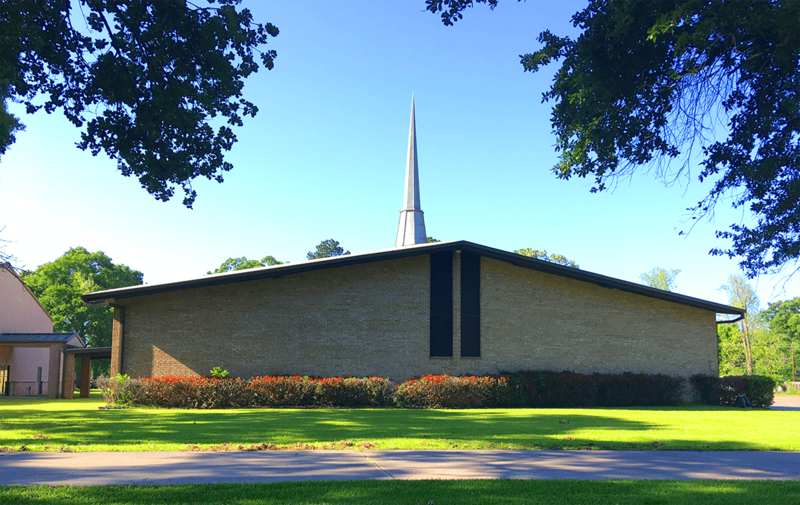 Our current building, the congregation’s third, was completed in 1984 and expanded in 2003. Several well-known ministers helped establish the character of the Liberty Church of Christ. Men like Jim Dobbs, Tom Warren, and James LeFan left their indelible marks of love for truth and love for the lost. Our current minister is Bryant Perkins, assisted and encouraged by his wife Abbey.